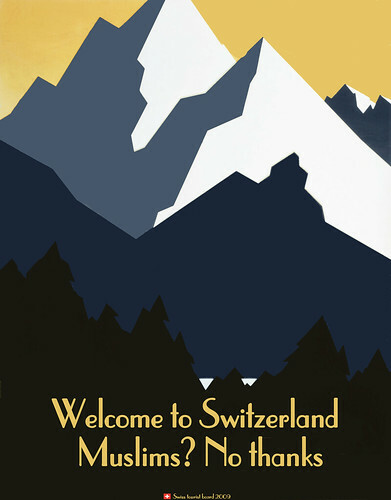 Welcome to Switzerland - Except if you're Muslim, originally uploaded by Teacher Dude's BBQ. "Voters in Switzerland have approved a ban on the construction of minarets on mosques, official results show. Of those who cast votes in Sunday's poll, 57.5 per cent approved the ban, while only four cantons out of 26 rejected the proposals. The result paves the way for a constitutional amendment to be made. "The Federal Council [government] respects this decision. Consequently the construction of new minarets in Switzerland is no longer permitted," the government, which had opposed the ban, said in a statement. The Swiss People's Party (SVP) had forced a referendum on the issue after it collected 100,000 signatures within 18 months from eligible voters." Ψήφισε και ο Ψωμιάδης. Panagiotis Psomiadis, candidate for leadership of New Democracy, originally uploaded by Teacher Dude's BBQ. Once again Greece goes to the polls, this time to elect the leader of the conservative opposition party, New Democracy. It's perhaps an indication on how the main stream media and the country's party political system feed off each other that even leadership battles get the kind of TV, radio and print coverage that other places reserve for coups, natural disasters and terrorist attacks. For weeks now TV screens have been full of thoughts, speeches and interviews of the candidates who have toured Greece endlessly in the race for votes. It's hard to believe from all the triumphal talk from the three main contenders is that their party suffered its worst defeat in a generation in October's general elections. Their disasterous second term which lasted less than two years was marked by a seemingly endless stream of gaffes and scandals which allowed the opposition socialist PASOK party to gain an unprecedented parliamentary majority. Also there has been little discussion of how the Greek economy has been ended up with massive debt load and a level of competiveness that ranks below Kazahstan and Botswana. Despite being elected in 2004 on a anti - corruption ticket, then prime minister Kostas Karamanlis burnt through his party's political capital even quicker than the government's borrowed billions after his re-election in 2007. Economic meltdown, dozens of graft scandals, country wide riots and massive forest fires finally convinced voters that New Democracy's slick PR machine was just hot air. Dora Bakoyianni, daughter of ex-prime minister Costas Mitsotakis, Antonis Samaras, New Democracy's prodigal son and Thessaloniki's own Berlusconi lite, Panagiotis Psomiadis are all standing today though the real battle is between Bakoyianni and Samaras who seem to have rougly the same level of support. Not that anyone really knows as Greece's pollers have refused to take part in any opinion polls citing lack of transparency in deciding who votes. How can you choose a representative sample of voters when nobody really knows who is voting? Over the last month candidates have been engaged in a bitter battle over how the leader of New Democracy will be elected with the kind of manouvering that would have brought a nostalgic tear to Machiavelli's eye. Finally, the answer has been a ill-conceived voting system which is tailor made for manipulation and corruption. Supposedly anyone, anywhere (and that includes the whole planet, apparently) can take part in the election via the internet. Already New Democracy's internet site has collapsed under the weight of those wishing to vote leading outsider, Panayiotis Psomiadis to go public with accusations of underhand dealing, intimidation and manipulation. Not that Psomiadis stands any chance to being elected but he does worry that if one of the two main candidates wins on the first round, his role as king/queen maker will be made redundant. The polls close at 8pm tonight so there's plenty more room for drama before all this over. 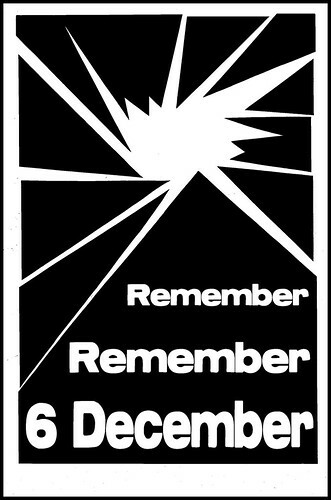 Remember, remember 6 December, originally uploaded by Teacher Dude's BBQ. On the evening of December 6th Alexandros Grigoropoulos, a 15 year old high school student was shot dead by police in the central Exarchia neighbourhood, Athens. 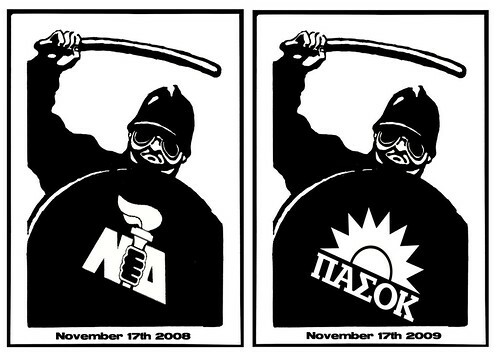 The death was to spark riots and protests throughout the whole of Greece and lead to billions of euros in damages. Whilst clashes between Greeks and the police were fiercest in the country's two largest cities fighting soon spread to even small towns and islands as outraged young people fought with the authorities and attacked shops and offices. One year on the first anniversary of the shooting many fear that next month will see a re-run of last year's events which took the government completely by surprise and left much of central Athens and Thessaloniki looking like a war zone with burnt out cars and flaming building filling the nightly news bulletins. Despite the crushing defeat of the previous conservative New Democracy administration in last October's parliamentary elections, the social problems which led to Greece's worst civil disturbances in 40 years have not gone away. Indeed given the deepening recession, the issues of unemployment, deep rooted social inequalities and a lack of hope for the future are even more entrenched than in 2008. Similarly, Greece's controversial police force appears to have learnt few of the lessons of December and have continued to be dogged by allegations of violence and human rights abuses by international organisations such as Amnesty International. In addition heavy handed policing tactics during the recent marches for the annual 17th November memorial seems to indicate that the police are ready to take on any challenges to their power and so avoid a repeat of last year's situation where many neighbourhoods became no go areas. The series of terrorist attacks on police stations and officers plus weekly incidents of bomb attacks on government targets and leftist organisations means that the scene is being set for a showdown between the those unhappy with the present political system and the forces of law and order. Remembering '68, originally uploaded by Teacher Dude's BBQ. Flowers for the dead, originally uploaded by Teacher Dude's BBQ. Tony Samaras - The Prince of Spam, originally uploaded by Teacher Dude's BBQ. 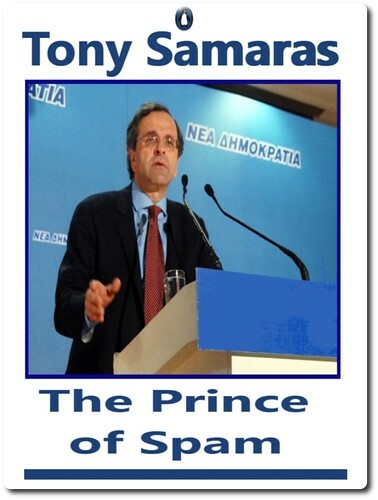 Antonis Samaras, contender for the leadership of Greece's main opposition party, New Democracy, has been sending out unsolicited SMS text messages to all and sundry in his effort to become the next head of Greece's conservatives. 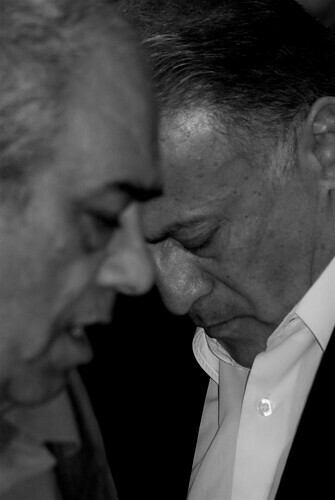 Since their crushing defeat in October's national election New Democracy has been engaging in a fratricidal campaign to replace Kostas Karamanlis who resigned just hours after the country's polls closed. Despite nearly two months of electioneering none of the three candidates have really answered how their party got the country into its current financial quagmire or how the last government's lending went from 2.5% of GNP in January 2009 to 14+% in October. And the band played on, originally uploaded by Teacher Dude's BBQ. "Remember, remember 6th December", originally uploaded by Teacher Dude's BBQ. With the first anniversary of the killing of Alexandros Grigoropoulos by a police officer last year in Athens the scene looks set for a repeat of last year's violent protests which engulfed most of Greece. 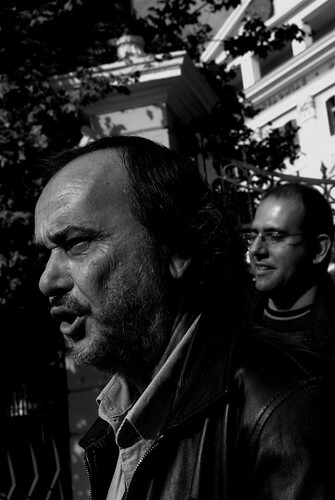 In the run up to 6th December there have been a number of bombings and attacks on both the offices of the ruling PASOK party and and anti - authoritarian communes in Thessaloniki and Athens. Nor do the police seems to have learnt the lessons of December 2008. Only last week a 35 year old Armenian woman was beaten in front of her two year old child by two plain clothes officers who accused her of insulting them. The fact that she was pushing a pram laden with shopping was not enough to deter them from handcuffing her, kicking her whilst she lay on the ground then taking her to a police station where she was held for six hours. 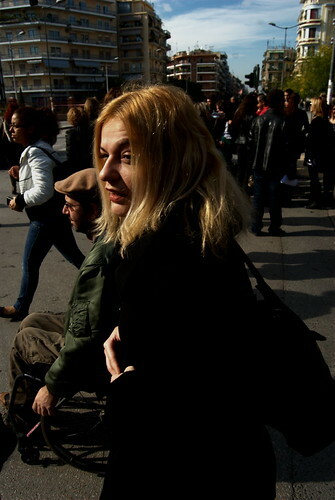 Portraits from the last day of the Thessaloniki Film Festival, originally uploaded by Teacher Dude's BBQ. 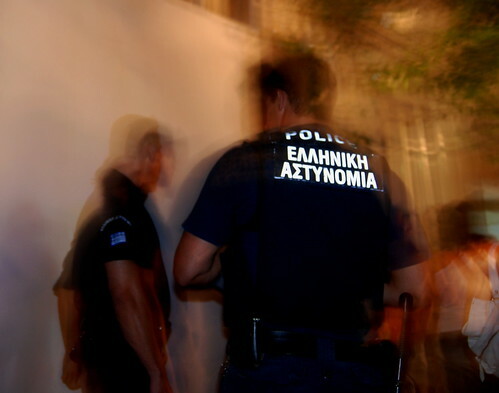 I just came across a story that once gain confirms my belief that the police here in Greece are out of control subject to little or no oversight. In an appalling case reported in the Eleutherotypia newspaper's site (see here in Greek) a 35 year old Armenian woman was beaten, handcuffed and detained in front of her two year old child home on the home from a supermarket in Athens last Thursday. According to the interview she gave to the newspaper the incident was triggered when the woman, who is married to a well - known Greek musician, was accused by plain clothes police in an unmarked car of insulting them. They then asked if she was from Romania and when she said that she was, in fact from Armenia demanded to know why she was in Greece. They then produced police ID and demanded she come with them to the local police station. When she went to get the pushchair carrying her child they grabbed her, pushed her to the ground, kicking and punching her in the belief she was resisting arrest. The hapless mother was handcuffed and taken with her child to the Aghios Pantelimenos police department where she was kept for four hours. 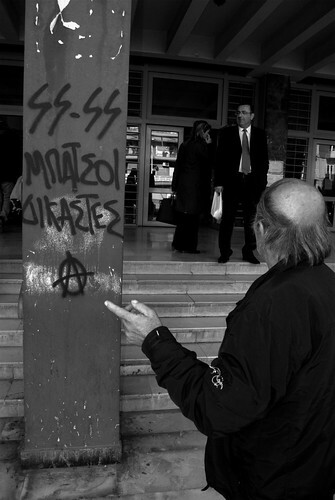 The Aghios Pantelimenos district of Athens has been in the news on several occasions over the last year following clashes with the far right group, Chrysi Aygi and immigrants living in the area. Many foreign born shop owners have also accused the police of turning a blind eye to racist intimidation in the area. War is peace - new strategic approach to Afghan conflict, originally uploaded by Teacher Dude's BBQ. Werner Herzog - Wild Blue Yonder, originally uploaded by Teacher Dude's BBQ. 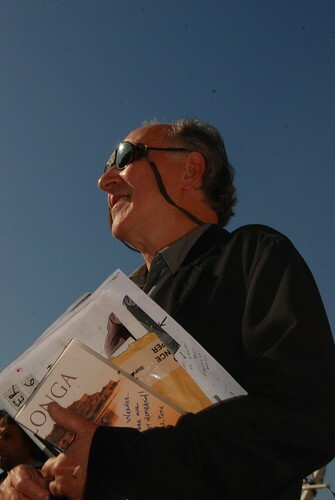 German director, Werner Herzog at the 50th Thessaloniki International Film Festival. Werner Herzog, originally uploaded by Teacher Dude's BBQ. Veteren German film maker, Werner Herzog was in Greece today to accept a Golden Alexander award at the 50th Thessaloniki International Film Festival. 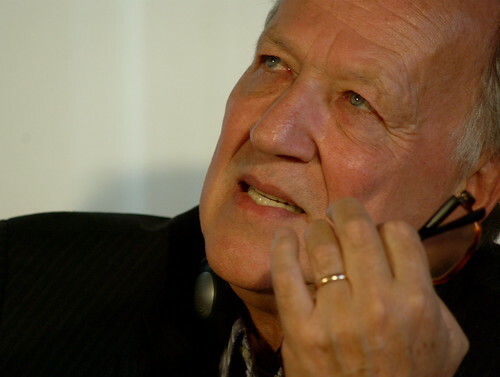 Herzog, director of 53 movies and documentaries such as Fitzcarraldo, Aguirre, The Wrath of God and Wild Blue Yonder will also be holding a masterclass tomorrow as part of the Greece's most prestigious film event. Shadows, originally uploaded by Teacher Dude's BBQ. Polytechniou Day - Greece, originally uploaded by Teacher Dude's BBQ. 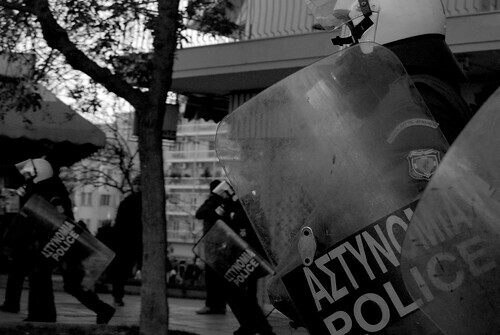 On 17th November 1973 the army sent in tanks to crush a student revolt in the Polytechnic university, Athens. The subsequent loss of life eventually led to the fall of the regime in 1974. 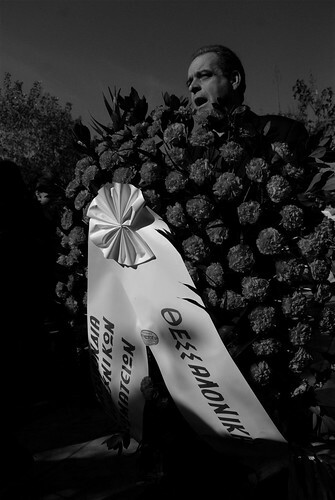 Right wing students attempting to disrupt a wreath laying ceremony - Thessaloniki, Greece, originally uploaded by Teacher Dude's BBQ. The Greek blogosphere has been full of complaints over the way the mainstream media covered yesterday's Polytechniou Day. It seems there has been a concerted effort to either play down or ignore much of what happened. For example much of Thessaloniki, Greece's second largest city was covered in a blanket of tear gas for hours on end as riot police fired round after round of the stuff into the university grounds to supposedly disperse a few dozen protesters. "Επεισόδια σημειώθηκαν και νωρίς το πρωί, την ώρα που άρχιζε η κατάθεση στεφάνων στο μνημείο των πεσόντων, στο προαύλιο της Πολυτεχνικής Σχολής του ΑΠΘ. Ομάδα φοιτητών του Πανεπιστημίου Μακεδονίας που πρόσκεινται στη ΔΑΠ προσπάθησαν να πλησιάσουν για να καταθέσουν στεφάνι, αλλά μέλη νεολαιών της εξωκοινοβουλευτικής Αριστεράς τούς υποδέχτηκαν με πέτρες. Ακολούθησε συμπλοκή στο οδόστρωμα της Εγνατίας οδού που κράτησε περίπου 15-20 λεπτά." 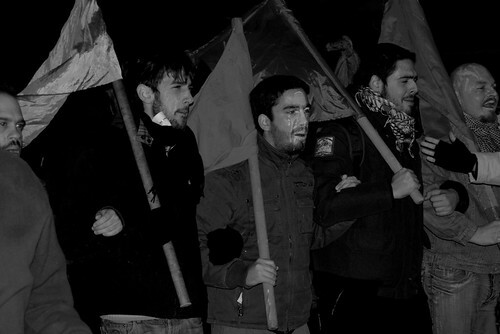 They were incidents early this morning when members of DAP (the student wing of the conservative New Democracy party) attempting to lay a wreath during a ceremony for the victims of the 1973 Polytechnic uprising at the Aristotelion university of Thessaloniki were stoned by members of the student supporters of the extra parliamentary left. The clashes that followed lasted approximately 15 -20 minutes." There were clashes but from what I saw many of those inside were preparing to defend the shrine set up inside the campus from attack by these hooligans. So why the discrepancy in the accounts? I'm not sure if it is just indifference, ignorance or a worry that the newspaper's political line must be preserved irrespective of the truth. "Limited use of tear gas"
"Limited use of tear gas" or "περιορισμένη χρήση χημικών" as they say in Greek is such a benign phrase suggesting that the police sent a few squirts in the general direction of those protesting, a little snifter, just to add to the atmosphere. 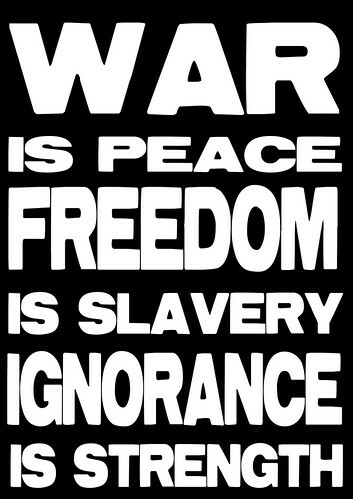 In reality there is no such thing, at least here in Greece. The police and especially the riot squad (MAT) don't do half measures as the residents of downtown Thessaloniki found out again last night. With a clouds of tear gas covering half the centre and forcing tens of thousands to lock themselves inside or rush indoors coughing and crying. Even as far away as the port which is over a kilometres away some film festival goers were complaining of sore eyes and difficulty breathing. All this to deal with a few dozen stone throwing youths who'd decided to use the university campus as a base to harass riot squad units opposite. As a result police shot round after round of tear gas into the grounds for over six hours. At one point firing canisters into the Polytechnic building, smashing windows and forcing students peacefully commemorating 17th November to flee. That's how I found myself trying to climb eight stories with the lungs of an 80 year old manic smoker. That's the one thing they don't tell you about tear gas is that tears are the least of your worries. It's what is does to your respiratory system that really scares, suddenly you cannot breathe, you feel like you're drowning. You draw a breath but nothing happens, no oxygen makes it inside, instead more of the vile stuff penetrates your lungs. Around you you can hear young kids hacking and coughing like patients on an emphysema ward, some desperately sticking their heads out of the window in order to take in something other than this poison. After what seems like hours I make up onto the roof and out of the building, even on the eighth floor below you cannot stay inside for more than a few minutes. 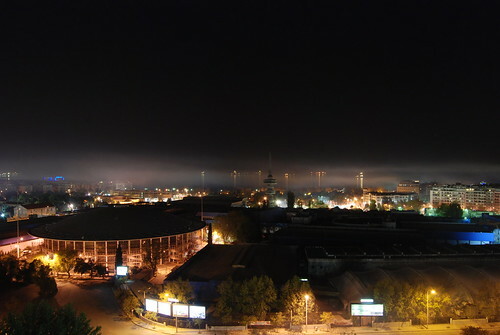 From up here the city looks peaceful, beautiful even, despite the layer of who knows what that blankets this part of the city. Later on when people have regained some measure of composure and made phone calls we then realise that we're trapped, all around the campus are riot police units, plain clothes cops and god knows who else ready to arrest anyone they consider suspicious. Just being here is cause enough and once in the their hands anything is possible. Unwanted flashbacks of the scenes of the savage beating of a Cypriot student captured by TV crews this night two years ago pop into my head. Having just arrived in the country he was naive enough to believe that being innocent he'd have nothing to fear from the police. Instead he was kicked and punched by half a dozen cops so badly that he spent weeks in hospital, his face an unrecognisable pulp. His crime stopping to answer their questions instead of running the hell away from there. More phone calls and eventually those on the roof descend and meet up with others who were still in the area, all in all a few hundred who make their way to the university's admin building where students negotiate with the dean over how to guarantee our safe passage off campus. 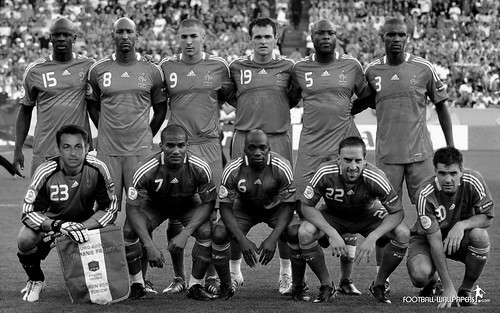 It's nearly three, cold and the adventure and adrenaline have long since worn off, thoughts of sleep and home take the place of indignation and protest, it seems to last for hours but in the end we all move as a group towards Kamara and the relative safety of the centre. 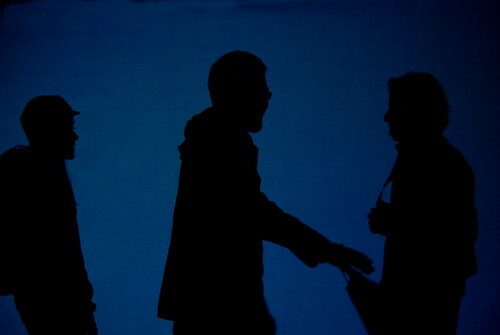 Here we can mingle in with night owls who even at this time fill the streets, cafes and bars. Right wing students try to disrupt 17th November commemoration in Thessaloniki, originally uploaded by Teacher Dude's BBQ. At first glance it looks remarkably like some kind of college graduation photo shoot, the students stand lined up on the steps outside the admin building all waiting for what's about to come. However, some details do not gel, many are wearing motorcycle helmets and those in the front two rows are carrying flag poles as thick as a man's fist.The paving stones in front of them as slick with a slimy substance which makes them treacherously slippery, a trap designed to fool anyone unwise enough to rush the central entrance of the Polytechnic block. Cautiously, the student supporters of the youth wing of the conservative New Democracy party or Dapites as they are known in Greek edge forward, hurling invective along with hunks of paving stone,empty beer bottles and even oranges. 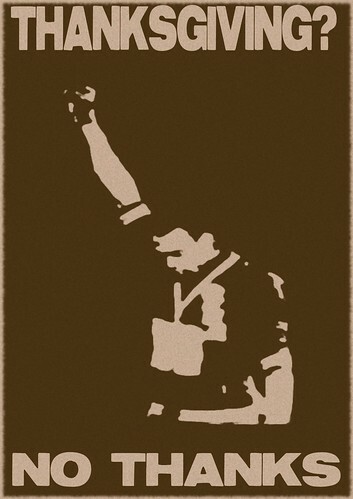 They dare those inside the university grounds to come out and fight them, and as if in a gladiator movie a lone anarchist casually strolls out to meet them, arms outstretched, palms up, the classic Greek gesture meaning, "come and get some." In response a hail of missile are hurled in his direction but he continues, oblivious to it all, taunting them with insults about their manhood. As he walks back to his comrades, the braver Dapites advance, urging on the more reticent among their ranks and suddenly they rush forward, seizing the initiative and charge those nearest the campus entrance. Their advance however, is quickly halted as communist and anarchist students counter attack, forcing the invaders to retreat to the relative safety of the opposite side of the boulevard. Today Greece commemorates 17th November 1973 when the then ruling military junta sent army tanks into the country's top technical university in order to crush a student revolt. The ensuing bloodshed and loss of civilian life set in chain a series of events that would eventually led to the downfall of the Regime of the Colonels in 1974. Every year the day is remembered with a series of wreath laying ceremonies, marches, concerts and violent confrontations between police and left wing student groups. 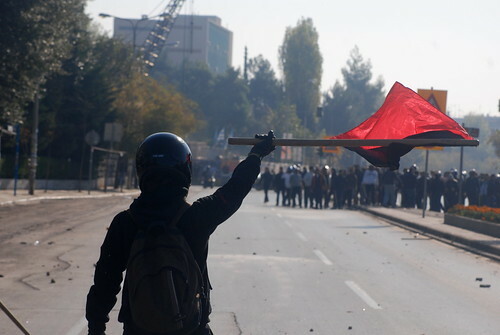 This morning's clashes between different student factions is simply a skirmish in what will later on today be the front line in the constant battle between the authorities and Thessaloniki's powerful anarchist movements. 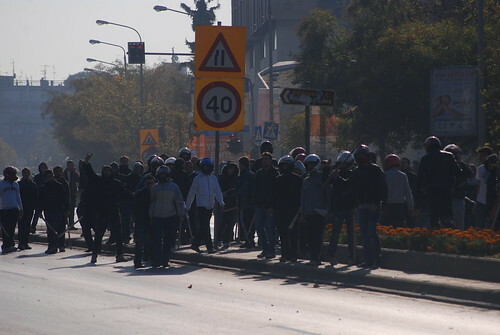 As the police are forbidden from entering universities the area around the Aristotelian campus is often the site of clashes between the riot police and protesters. 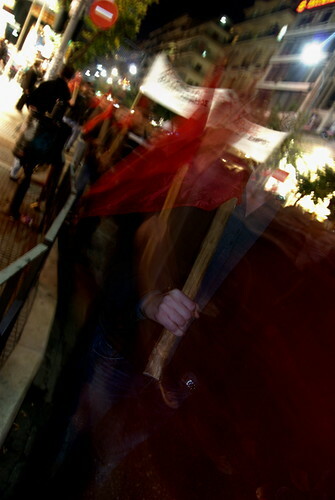 Although in previous years this conflict had become almost ritualistic in its adherence to tactics and targets, the massive wave of protests which hit Greece last December following the death at the hands of the police of a 15 year old in Athens means that the rule book has been ripped up and nobody can be sure that neither side will be content to settle for the symbolic victories of past encounters and not hunger for something more substantial. Urban Screen project at the 50th Thessaloniki Film Festival, originally uploaded by Teacher Dude's BBQ. 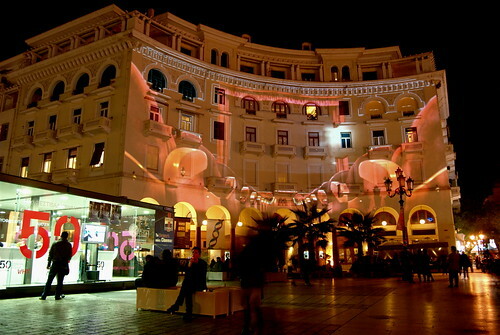 The Urban Screen project outside the Olympion cinema in Thessaloniki. 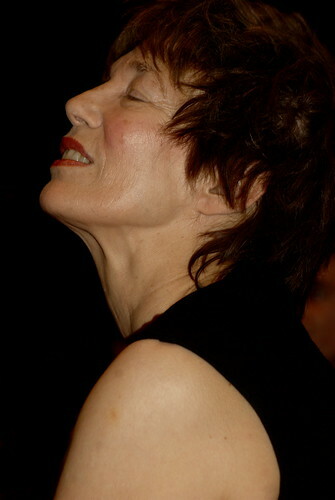 Part of the 50th Thessaloniki Film Festival. 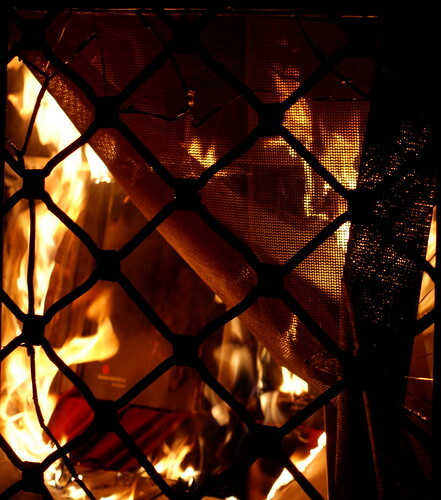 November 17th now and then, originally uploaded by Teacher Dude's BBQ. Jane Berkin, originally uploaded by Teacher Dude's BBQ. Dionysis Fotopoulos , originally uploaded by Teacher Dude's BBQ. Dionysios Fotopoulos, the award winning set designer was in Thessaloniki last night to open a new exhibition of his work hosted by the city's museum of cinematography. 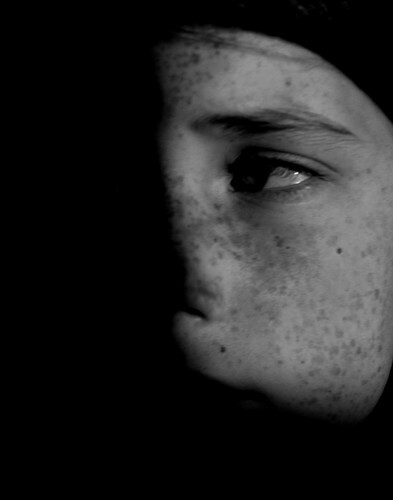 The exhibition which is part of 50th Thessaloniki Film Festival will continue until until December. 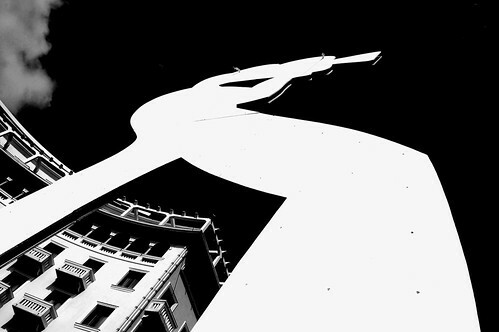 Amidst boycotts, rows over funding and worries over the future of cinema as a whole the 50th Thessaloniki film festival opened last night bringing a touch of silver screen glamour to the northern port city of Thessaloniki. 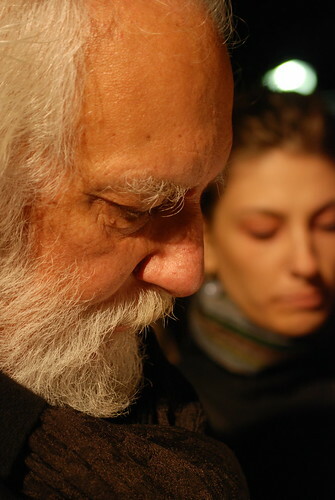 However, ongoing disputes of how the Greek government's funds the country's movie maκing industry have meant that most local films have nor been entered for competition this year. The protest by a group calling itself Film Makers in the Mist made up many of the country's leading directors was organised in order to demand more transparency over how money raised through taxation on cinema tickets is spent by the government. 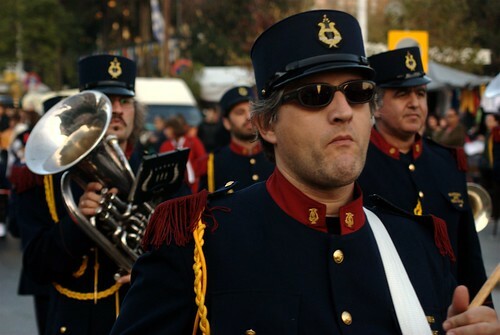 Recently elected Pavlos Geroulanos, minister for culture and tourism however, used his speech in the opening ceremony to launch a thinly veiled attack on the previous government's funding policies which he said discouraged pluralism and had helped create a culture of silence and complicity. In addition to local concerns this year's festival slogan, "Why Cinema?" reflects deeper worries within the European film industry over what the future holds for movies in an era in which new technologies are sweeping away older certainties. Despite these concerns Greece's largest movie event started off confidently with Soul Kitchen, the work of leading Turkish director Fatih Akin who was later to be seen manning the decks as he DJed the first night party which only finished towards dawn. The festival which lasts till 22nd November will feature hundreds of full length features, shorts and documentaries as well as a number of concerts, street performances and master classes by film makers such as the veteran German director, Werner Herzog. For more photographs see Demotix. 50th Thessaloniki Film Festival - opening night, originally uploaded by Teacher Dude's BBQ. Managed to get crash the Thessaloniki Film Festival twice last night and had a great time, didn't get home to way past my bedtime. As you can see from the photo the opening day party last night was enjoyed by all. 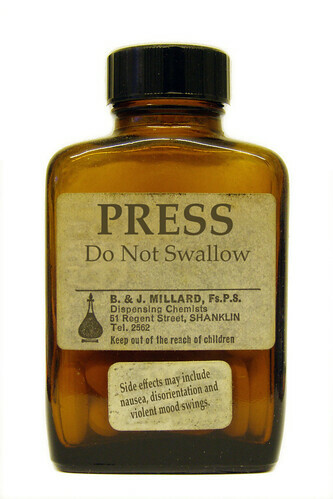 PRESS - Do Not Swallow May '- 68 Revisited, originally uploaded by Teacher Dude's BBQ. 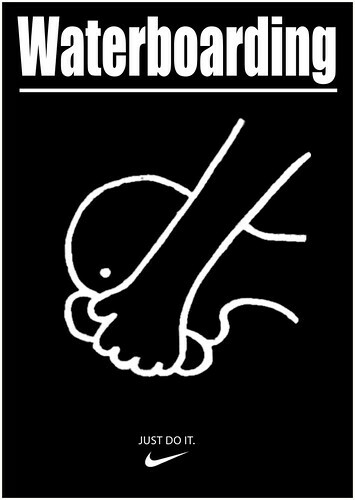 Waterboarding - Just do it, originally uploaded by Teacher Dude's BBQ. "You may have read by now the official lie about this treatment, which is that it “simulates” the feeling of drowning. This is not the case. You feel that you are drowning because you are drowning—or, rather, being drowned, albeit slowly and under controlled conditions and at the mercy (or otherwise) of those who are applying the pressure. The “board” is the instrument, not the method. You are not being boarded. You are being watered. This was very rapidly brought home to me when, on top of the hood, which still admitted a few flashes of random and worrying strobe light to my vision, three layers of enveloping towel were added. In this pregnant darkness, head downward, I waited for a while until I abruptly felt a slow cascade of water going up my nose. Determined to resist if only for the honor of my navy ancestors who had so often been in peril on the sea, I held my breath for a while and then had to exhale and—as you might expect—inhale in turn. The inhalation brought the damp cloths tight against my nostrils, as if a huge, wet paw had been suddenly and annihilatingly clamped over my face. Unable to determine whether I was breathing in or out, and flooded more with sheer panic than with mere water, I triggered the pre-arranged signal and felt the unbelievable relief of being pulled upright and having the soaking and stifling layers pulled off me. I find I don’t want to tell you how little time I lasted." STAGE workers demonstrate - Thessaloniki, Greece, originally uploaded by Teacher Dude's BBQ. 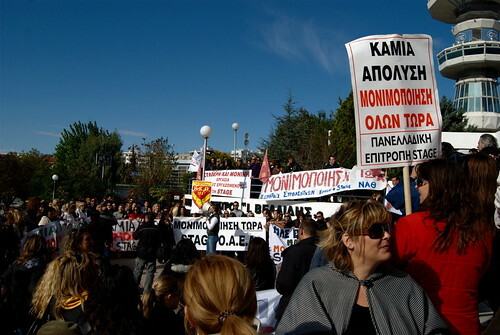 Nearly a 1000 employees with the state run Stage work experience program demonstrated in the centre of Thessaloniki protesting the new government's decision to not to give them permanent contracts. The 50th Thessaloniki Film Festival opens tomorrow and click here to see the program in English and here to see it in Greek. 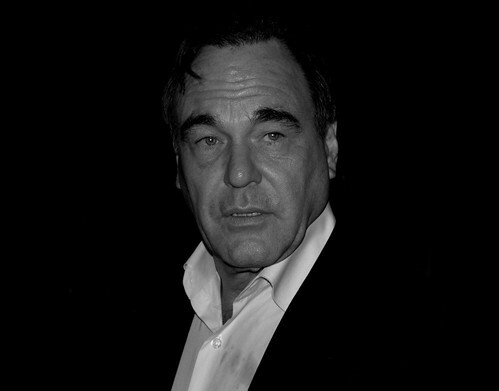 My pictures below from previous film festivals. 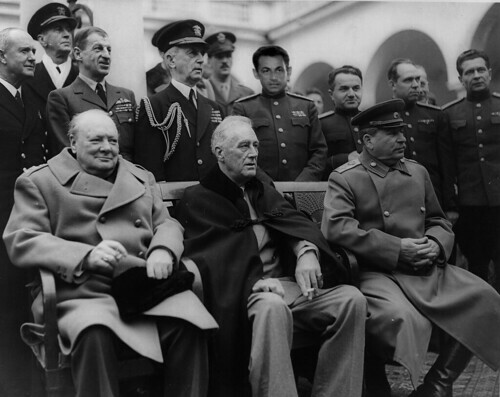 Although French media have been quick to cast doubt on Nicolas Sarkozy's claims to have been present at the fall of the Berlin Wall in 1989 photographs have now emerged that definitively prove that the French leader has a Zelig like ability to be present at the 20th century's most important events. As a Fullbright student Sarkozy manages to find his way into high society during his stay in the United States during the early 60's. 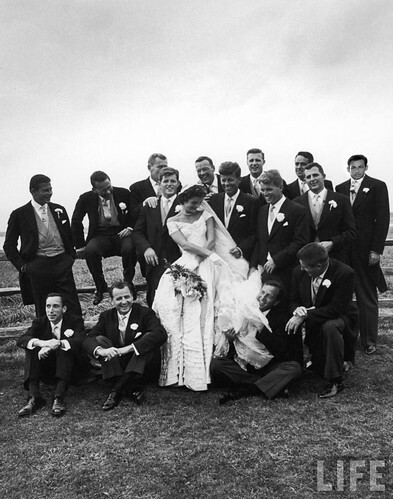 He becomes a regular feature in the Kennedy's compound in the years leading up to JFK's term in the White House. 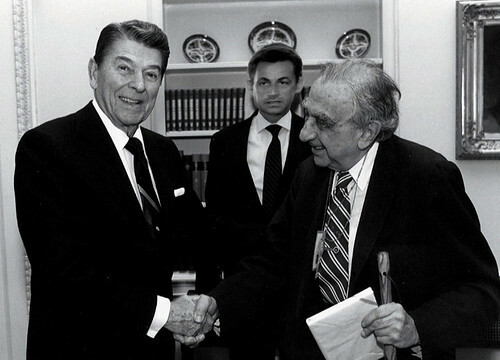 Later, with Sarkozy's drift to the right his presence in the American capital comes to the attention of Ronald Reagan who is quick to mentor his young French admirer. As an ardent supporter of US foreign policy in the Middle East the future president of the French republic feels that his country's interests are best served by him taking a hands on approach to the invasion of Iraq and the overthrow of Saddam Hussein. 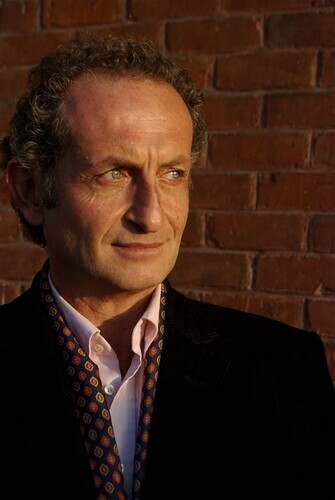 However, as his political career starts to wane in the early 90's Sarkozy decides to return to his first love, football as a result he is instrumental in helping the country's national team achieve international success during his brief stint as goalkeeper. Sarkozi is history, originally uploaded by Teacher Dude's BBQ. 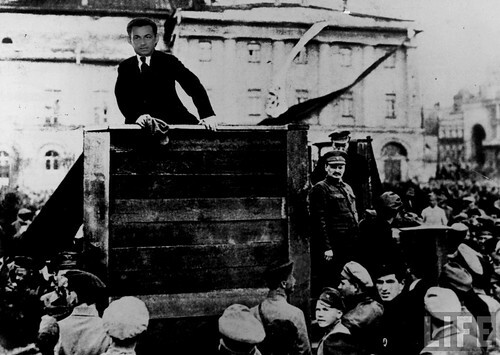 A young Nicolas Sarkozy addresses the masses in St Petersburg on the eve of the October Revolution. However, in the years that follow Nicholas attempts to play down his youthful transgressions. 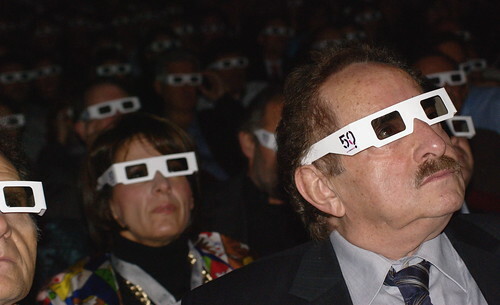 Later Nicolas through force of personality and determination managed to reach the very highest circles of international politics to give his personal stamp to events shaping the world. 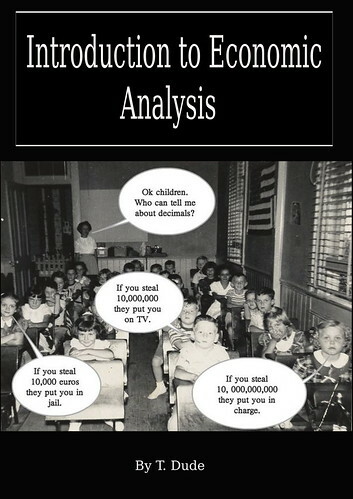 Introduction to Economic Analysis - T. Dude, originally uploaded by Teacher Dude's BBQ. Greece does not produce cars not does it manufacture computers. It relies instead upon tourism, shipping, agriculture and construction. So, when you read that the contractors who built the Greek stand at the world's most important trade fair in London have been forced to go to court due to to the country's government's unwillingness to pay them on time then you have to wonder what the hell is going on. It seems that the previous conservative New Democracy administration carried out a scorched earth policy as far the country's economy is concerned. It wasn't enough to borrow huge amounts of money "off the books" so putting futures generation in hock for decades to come. That would have been too simple. In addition they left a legacy of debt and mistrust in virtually every area of public life, including Greece's vital tourist industry which now owes millions to advertisers such as CNN, Google, MTV and even 67,000 euros to London taxi drivers. It was only the last minute intervention of recently appointed junior minister for the economy Kostas Papakostas that averted the mortifying spectacle of the English bailiffs seizing Greece's national Tourism Organisation (EOT) assets as a result of a court order due to outstanding debts stemming from a trade fair in 2008. Not that any of this worries the future leadership of New Democracy. You'd think that running the country's economy into the ground and being on the business end of the worst electoral defeat in a generation would give people pause for thought. Nothing of the kind. The four, sorry now three candidates for the leadership of New Democracy have done little else since their election debacle of October 4th than fight amongst each other over how the next party leader will be elected. There has been little or no discussion over why their party have seen its worst defeat since 1981 or why despite winning power three times since its inception in 1974 New Democracy has not once been able to serve a full four year term. Looking at the three remaining candidates Dora Bakoyianni, Antonis Samara and Panayiotis Psomiadis you cannot but be reminded of the Titanic. The current backroom deals over who is going to become leader of New Democracy on have as much relevance as arguments over who is going to share the captain's table on that unfortunate vessel. Haven't you killed enough people for one day? 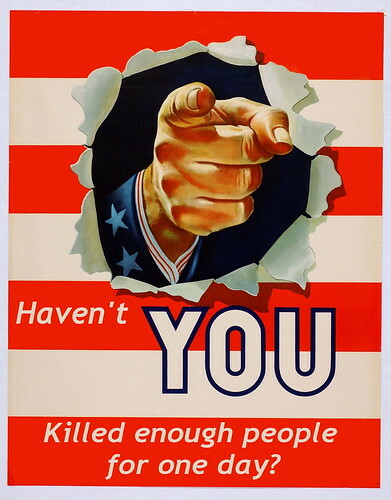 Haven't you killed enough people for one day?, originally uploaded by Teacher Dude's BBQ. I know it's a little late but I thought I'd post this anyway. It's aimed at advanced and upper - intermediate students. 2 - Explain any words such as gunpowder, plot and treason then ask them in groups to speculate on the meaning. Click here for more background on the Gunpowder plot. 3 - Each groups writes up their opinion in just one sentence and puts in on the board. 4 - Students then use Youtube to find out what happened. Alternatively, you set this for homework. 5 - In order to avoid students simply copying and pasting from Wiki each group has to present the events in just 60 seconds without the aid of notes. Another idea is that the present a 2 minute slide show. 6 - When you feel that the students have understood the facts behind the Gunpowder Plot then tell them that they are going to pretend that they are journalists who are reporting the event as if it was happening now. To hep understand the idea direct them to the BBC's On This Day web page where historical events are reported as if they were breaking news. 7 - The easiest way to do this is find a similar news story from recent times and change the details in order to make it fit in the Guy Fawkes story. 8 - The students then produce a version that can be filmed. 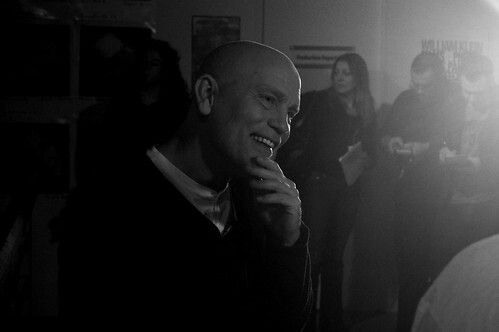 The students form groups in order to decide how to shot the story as a straight to camera news piece. Show them some examples from CNN and Reuters. They can use the video camera, mobile/cell phones, web cameras or digital cameras for this. 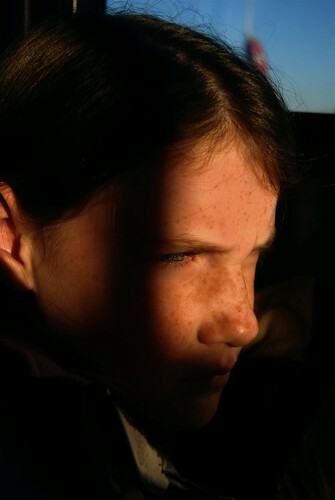 The footage can be edited with Window Movie Maker or iMovie. Alternatively, they can download footage from Youtube (Real Player will let you do that) and do the report as a voiceover. On a technical note videos from Youtube are .flv files whch cannot be used in Movie Maker, however Real Player does allow you to convert .flv to .wmv which are compatible. I'm currently doing this with students though from a slightly different starting point. Instead of Guy Fawkes they choose a place and time in history they'd like to visit and report on that instead. High school students in protest for better schools - Thessaloniki, Greece, originally uploaded by Teacher Dude's BBQ. 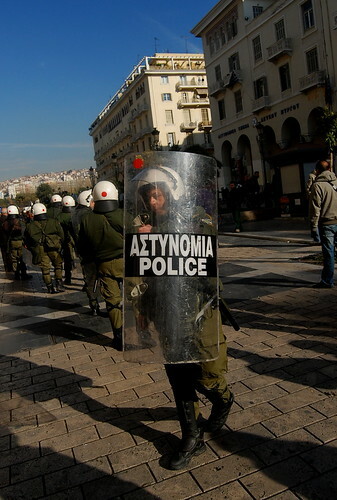 As anyone who reads this blog on a regular basis knows I'm no fan of the Greek police. I have seen their senseless brutality too often to believe that they are the "thin blue line" between us and chaos. There have been too many cases in which officers have attacked and beaten those they are supposed to be protecting, asylum seekers, protesters and minorities being their usual targets as reports by the UNHCR, Amnesty International, EU attest to again and again. The flip side of this willingness to turn a blind eye to the law is incompetence and corruption. The cop who can beat detainees with impunity is also free to indulge in any other number of "extra curricular" activities, knowing that oversight is non - existent and chances of being punished slight. Case in point being yesterday's double tragedy in the four star Nefeli hotel in the upscale Panorama neighbourhood in Thessaloniki. Within 24 hours two young men died of carbon monoxide poisoning, most probably caused by a faulty heater. After finding the body of a 27 year old man on Thursday the coroner, suspecting CO asphyxiation asked the police to call in experts to examine the hotel. According to the police reports the case was investigated and finding no problems they gave it a clean bill of health. Neither the police nor the hotel management ordered an evacuation of the building despite the coroner's concerns. If they done so the second young man, a 28 year old athlete from the northern Greek town of Karditsa most most certainly be alive today. Instead he became the second victim of CO poisoning during the early hours o Friday morning. Only then was the hotel finally evacuated and the source of the leak found. Now when you read about such cases you have to wonder how sch a tragedy can happen. It seems clear that the hotel was negligent in its maintenance procedures and that lead to the first death. However, how was the second person allowed to die? What "experts" were called in? Which officers handled this case? What promises were made by whom to whom? Of course we will learn little or nothing of what really happened this week, the police are not going to let one of their own go to the wall for this. No, the culture of silence and complicity will make sure that even if charges are brought they will come to nothing. And so the cycle goes on unbroken, all the meanwhile crime rates go through the roof, terrorists operate with impunity and many have to live daily with fear of the police. This is by no means an exclusively Greek phenomenon, just yesterday the British riot squad was condemned by the Guardian newspaper for upholding just nine complaints out of more than 5000 lodged. "A former Royal Marine, Jones has had 31 complaints lodged against him since 1993. Twenty-six were assault allegations, most of which had been lodged by black or Asian men, but none were substantiated." For more on the story in Greek click here and here. So, Gordon we're in Afghanistan to preserve democracy? Would I lie you? 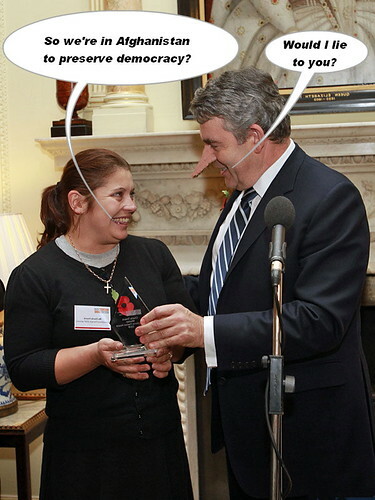 So, Gordon we're in Afghanistan to preserve democracy? Would I lie you?, originally uploaded by Teacher Dude's BBQ. "CRAIG MURRAY, FMR. UK AMBASSADOR TO UZBEKISTAN: I got called back to London and I expected there, you know, to have a sensible talk about the merits or demerits of the intelligence and how much evidence I had that it was obtained under torture. 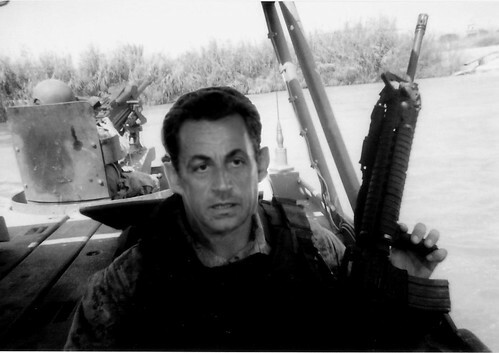 I was absolutely stunned, genuinely stunned—it changed my whole worldview in an instant—to be told that—and I knew it was coming from torture—that it was not illegal, because our legal advisers had decided that under the United Nations Convention Against Torture, it is not illegal to obtain or use intelligence gained from torture, as long as we didn't do the torture ourselves. I just couldn't believe the chap who was telling me this, the foreign office's chief legal adviser, Sir Michael Wood, [who] was somebody I'd known for many, many years. He was a nice man. He is a nice man. And how somebody—you know, I thought, you're talking about children being tortured in front of their parents, and you're saying, "Well, I don't think Clause 4 quite covers it, and given this particular legal meaning of the word 'complicity'." 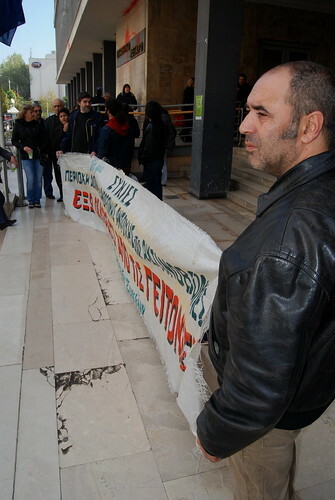 Workers in the STAGE program protest outside the ex - ministry of Macedonia and Thrace. STAGE workers demonstrate outside ex-ministry of Macedonia and Thrace, originally uploaded by Teacher Dude's BBQ. Residents of Sykies protesting ahead of a court case over mobile phobe base stations in their neighbourhood.